It's called Cayla, it's about a foot tall, and it can be used to listen to and talk to the child playing with it. But who is doing the listening? Anyone in Bluetooth range, reports Germany's Federal Network Agency (Bundesnetzagentur). 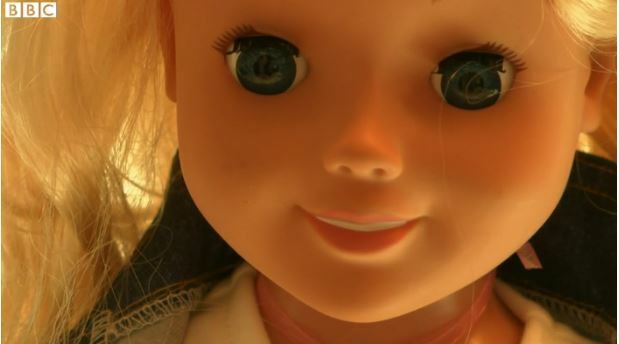 An official watchdog in Germany has told parents to destroy a talking doll called Cayla because its smart technology can reveal personal data. ... The Vivid Toy group, which distributes My Friend Cayla, has previously said that examples of hacking were isolated and carried out by specialists. However, it said the company would take the information on board as it was able to upgrade the app used with the doll. The Cayla doll can respond to a user's question by accessing the internet. For example, if a child asks the doll "what is a little horse called?" the doll can reply "it's called a foal". Watch the BBC's video of Cayla, in its squeaky, sinister voice, say "I've been hacked to say all sorts of scary things." Cayla was on Boing Boing last year when the FCC received complaints about it. Cayla is on Amazon for $45. It's so easy to hack that everyday YouTubers are at it!